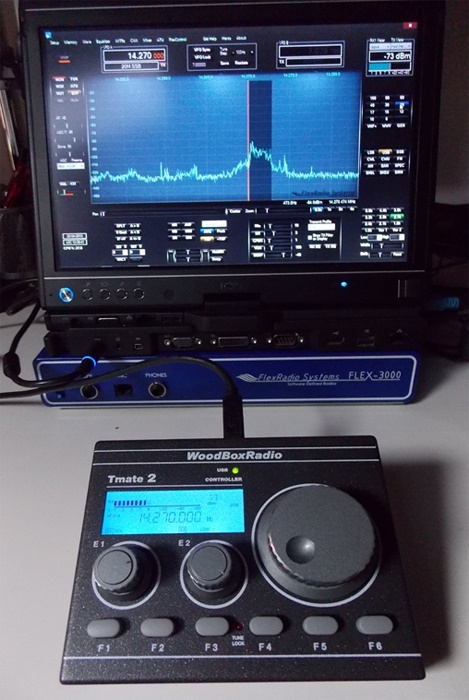 The TMate2 is a controller for various SDR software programs. It offers the operational comfort of a traditional radio, combined with the most up-to-date technology of an SDR. The TMate2 controller is connected by USB to the computer running the SDR software. Depending on the software it offers controls for many functions which are known from a traditional radio front panel. The backlit LC display (with selectable colour) shows the current frequency, the signal level, the current mode and much more. Six push buttons are available for often used functions, for example for mode selection, step width, receiver mute etc. Two smaller and one large rotating encoders with heavy metal knobs serve for the frequency selection, volume or filter width control. Each of the rotary encoders is also a push button, which is used for example to switch functions temporarily. A huge benefit of the TMate2 is, that the control of the SDR program is still possible in cases, where another software is active in the foreground of the computer. The connection of the TMate2 to the computer is done by a USB cable. The controller uses the standardized HID protocol for USB devices, and thus does not require special drivers on recent operating systems. The case is made from metal, giving the TMate2 a solid touch and feel. A USB cable is included in shipment. The power supply is done over USB, no separate power supply required. Size 143 x 78 x 135mm, panel tilted by 45°, weight 780g. Please note: The actually available functions of the TMate2 controller depend solely on the software in use. Not every software will offer all functions, not always are the functions freely programmable by the user.